A couple of years ago, no one recognized the real estate bubble even though it was under everyone's nose. Now, analysts and bloggers are seeing bubbles everywhere they look. One of them, they say is in Brazil whose Bovespa stock market index has doubled in the last 12 months. A "sensible" economic framework has been in place since the 1990's. This has included inflation targeting, a floating exchange rate and primary fiscal surpluses (the surplus before interest payments are made to service debts). This sensibility has been extended by the current administration that has given the Central Bank greater operational autonomy, raised the target for the primary fiscal surplus, pursued policies of "de-dollarizing" public debt and building a large cushion of foreign exchange reserves to reduce external vulnerabilities. Some observers say that Brazil has "put its house in order" -- by consolidating public finances and taming inflation -- and has achieved a "happy medium" between the roles of the public and private sectors. They contend there is a broad consensus between the political class and business sector over the macroeconomic policy orientation. The structure of Brazil's economy provides benefits. The country has a large and growing domestic market, and its exports account for less than 15% of GDP. That's lower than most other emerging markets, and local demand has been sustained through targeted tax breaks and a cycle of monetary easing. Also, backed by a large cushion of reserves amassed in recent years, the Central Bank was able to offer dollar liquidity at the height of the global financial crisis to companies needing to refinance. Brazil's labor force has been growing and, as we are seeing in China, is expected to be among the main factors that will drive domestic consumption over the medium term. Brazilians believe that a sense of urgency created by the staging of the World Cup in 2014 and the Olympics in 2016 can be "very positive" as it spurs the public and private sectors to carry out badly needed infrastructure investments. Things in Brazil are going well but not everything is perfect. Businessmen point to poor infrastructure and issues related to weak tax and labor reform. It will be difficult for the country's public and private sectors to tackle their greatest challenge: bridging the gap between Brazil's "separate countries" -- the first world at the core of its big cities with world-leading companies and high purchasing power, and the third world keeping millions living in poverty in smaller cities and the countryside. Despite these problems, there are more things going right than are going wrong. As confirmation, S&P and Fitch upgraded their ratings for the country in April and May, followed by Moody's this September. The World Bank predicts that if Brazil continues on the path it is on now, it will move from being the tenth largest economy in the world today to the fifth largest by 2016. That doesn't seem like the description of a bubble to me. There are a number of ETFs that provide exposure to Brazil. 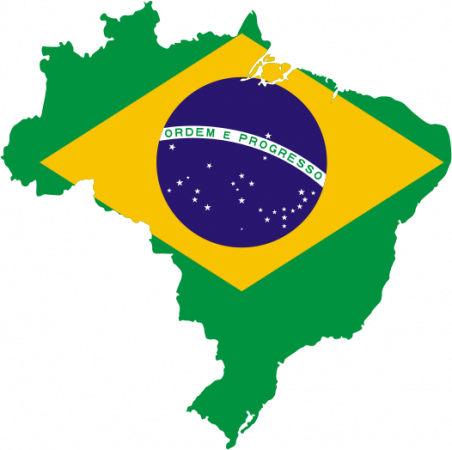 The largest and most liquid is the iShares Brazil ETF (EWZ) which tracks the MSCI Brazil Index and contains 67 Brazilian companies that trade primarily on the Bolsa de Valores de Sao Paulo. It covers roughly 85% of the Brazilian stock market. There is the Market Vectors Brazil Small-Cap ETF (BRF) from Van Eck. This ETF is comprised of more of the smaller companies that are less dependent on exports. This ETF is a bet on the continued growth of a consuming middle class. There is also the Wisdom Tree Dreyfus Brazilian Real Fund (BZF). This ETF is intended to provide currency exposure. BZF seeks to achieve returns that reflect money market rates in Brazil available to foreign investors and changes in value of the Brazilian real relative to the dollar. Finally, if you want exposure to all of Latin America with a strong shot of Brazil included, there is the iShares S&P Latin America 40 ETF (ILF).This is route that I chose to take after seeing four or five Latin America country ETFs on the Swing Signals list a couple of months ago.Some of the largest holdings in this ETF are Brazilian stocks so it is tracking EWZ reasonably closely. 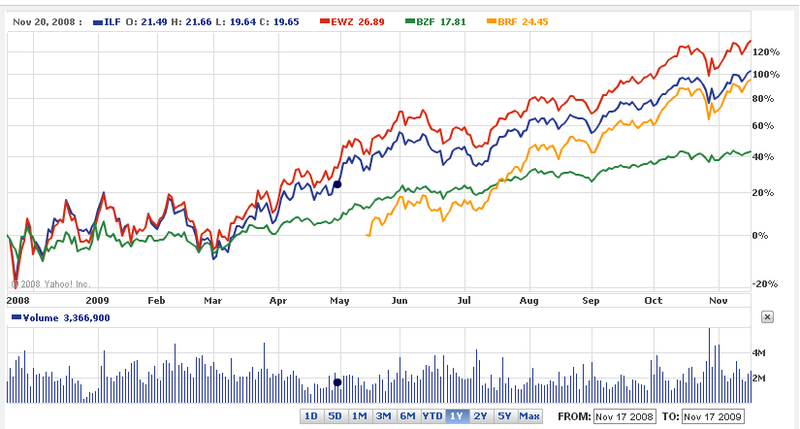 The chart above contrasts the performance of all four ETFs. Yes, they have shown steady gains. 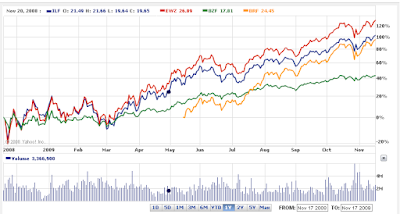 Today's analysis suggests that one of these ETFs could be a core holding over the long term. Source: Lessons from Brazil: Why Is It Bouncing Back While Other Markets Stumble? This is a good article. I have been investing in Brazil since 1999. Outside of investments there, I have targeted the ETFs and the bank ADRs because they are tradeable in US dollars. One aditional item to note for concern is the bubble that is growing in real estate in the major cities. Having lived through one here in the U.S., the same symptoms are showing up -- fancy developers, pre-construction contracts, flipping contracts a few times before closing, prices increasing at multiples, etc. There will be a correction at some point in the future. A good resource to find Brazilian companies and Brazilian business information is B2Brazil, which you can visit at http://www.b2brazil.com. I will be happy to get some assistance at the beginning.